The ACH Network Challenge is designed to foster new ways to enable usage for Same Day ACH to improve efficiencies and added capabilities within the payments ecosystem. 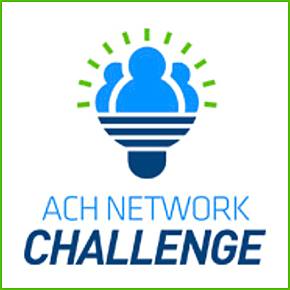 This year’s ACH Network Challenge invites teams to submit ideas for the best uses for Same Day ACH. The Challenge is open to everyone – corporates large and small, small-medium business, financial institutions, fintechs and solution providers, governments and nonprofits. Consider one of two scenarios and tell us how you would use, or enable others to use, Same Day ACH to pay or be paid faster. Scenario #1: Go beyond the often cited and well-documented payroll or insurance claim Same Day ACH use cases and submit your ideas – either those already in use or concepts still being incubated. Scenario #2: Imagine yourself as an entrepreneur interested in starting up a fintech. You see competitors already using Same Day ACH and enjoying the benefit of being paid, or making payments quickly, safely and effectively. Consider your product and market audience, and the problem you’re trying to solve.